Sleep under the emblem of the crown of France at the Hotel du Lys. The Experienced Travelers appreciate a good deal. Our cutting-edge “Found Money” economic strategy operates on actual cash savings, so we’re always on the lookout for a bargain to share with the Readership. For the last Paris visit I wanted to change things up a bit and stay in the 6th instead of the usual ET haunt in the 7th near the rue Cler. Melinda left the hotel search to me, so the pressure was on; if it’s a dud, I’ll suffer pointed stares while quickly formulating plan B. My “Found Money” goal was to pay under 140€ per room for a two-or three-star hotel in a central location. With my trusty Hotel spreadsheet at the ready, I consulted reliable sources – the Fodors travel forum, TripAdvisor, Slow Travel France and Sandra Gustafson’s Great Sleeps series. One recommendation came up over and over, and it was in the neighborhood where I wanted to stay! 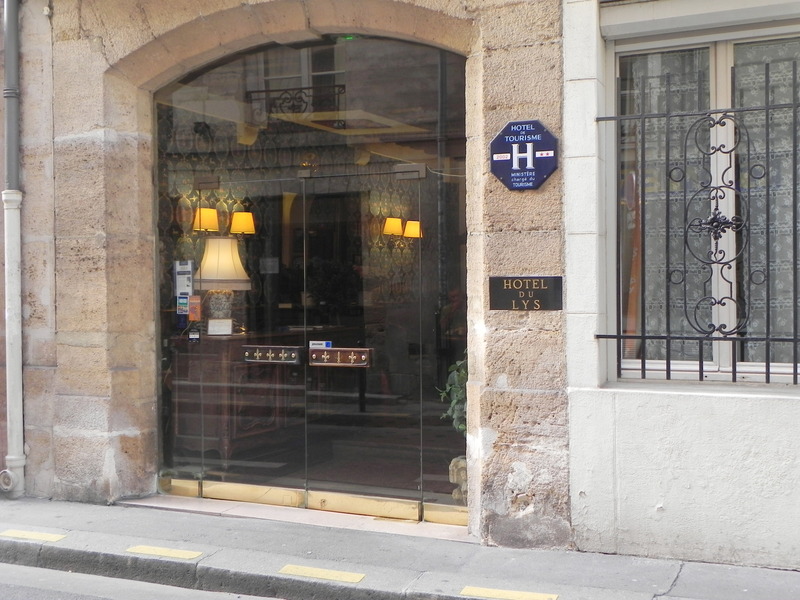 The Hotel du Lys in the rue Serpente, between the St.-Michel and Odeon metro stops fit the bill, at 110€ or 125€ including breakfast. So I booked online and hoped for the best. 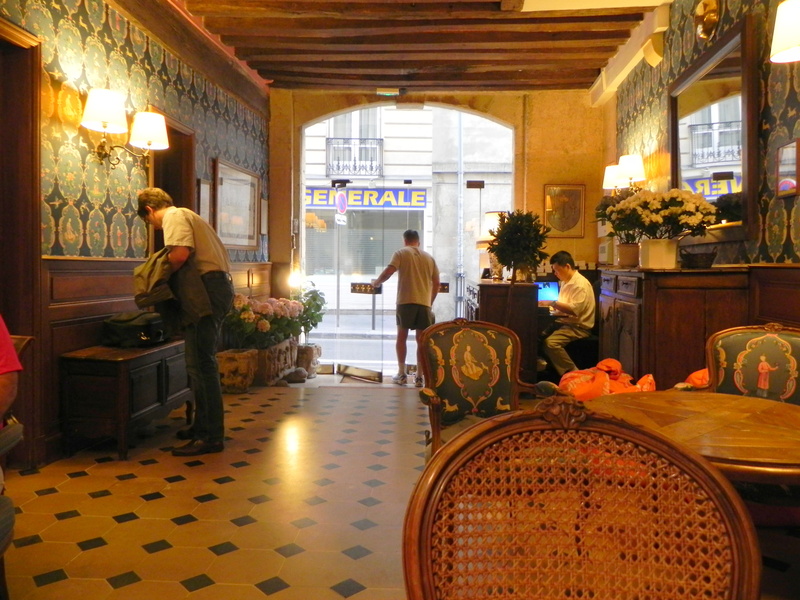 We arrived after our overnight flight and found the Hotel du Lys exactly as promised. Melinda opted for the cozy single. 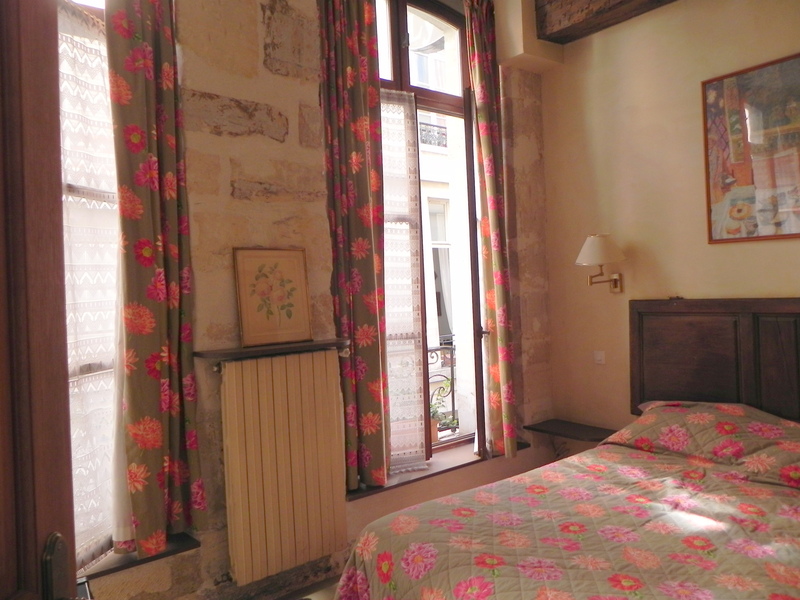 I took the comfortable double room with exposed stone walls and two large windows overlooking the rue Serpente. My double room was airy and comfortable - just right for one or two ETs! The beds and linens were excellent, the bathrooms were compact but well-appointed, and there were small writing tables and room to store suitcases and hang clothes. ETs insist on cleanliness and we were not disappointed. There’s wireless internet throughout the hotel that actually only worked in the lobby, but the ETs are flexible. 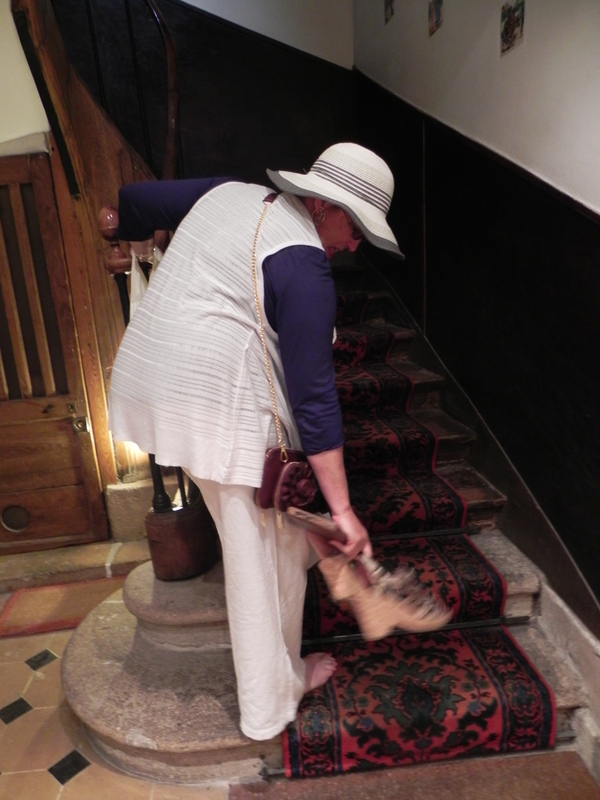 We're up to it - 17th century aristocrats climbed these stairs all the time! It’s worth noting that there’s no elevator or air conditioning. Brave Melinda faced five flights of worn spiral stairs to her rooftop aerie, which got a little warm during the day. After a day of walking, Melinda prepares for the climb. Note the chic wedgie shoes come off first. 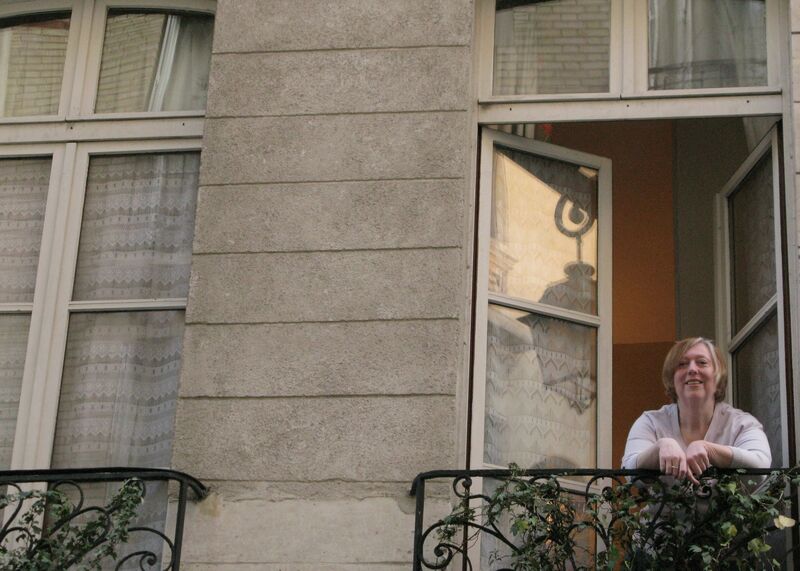 But the climb was worth the price of 110€ and her quiet room looked out over the rooftops. If stairs are an issue, there are two rooms directly off the lobby, so you can go from bed to bistrot in a matter of moments. The Hotel du Lys is bastion of tradition in a sea of nouveau-chic hostelries. If your taste runs to Philippe Starcke décor, you may want to look elsewhere (and pay more). This is a family-owned enterprise where the owner works the front desk, room keys hang on a pegboard in the lobby and well-behaved dogs are welcome. 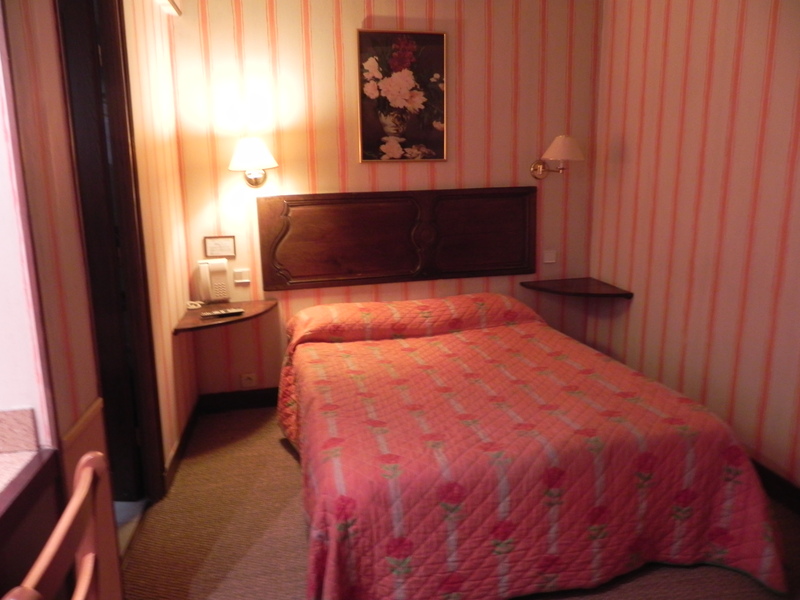 Like the ETs, the Hotel du Lys has its idiosyncrasies. The website declares “We have tried to make this old house as attractive and comfortable as possible in spite of the little inconveniences which we must accept as a tribute to the past”. 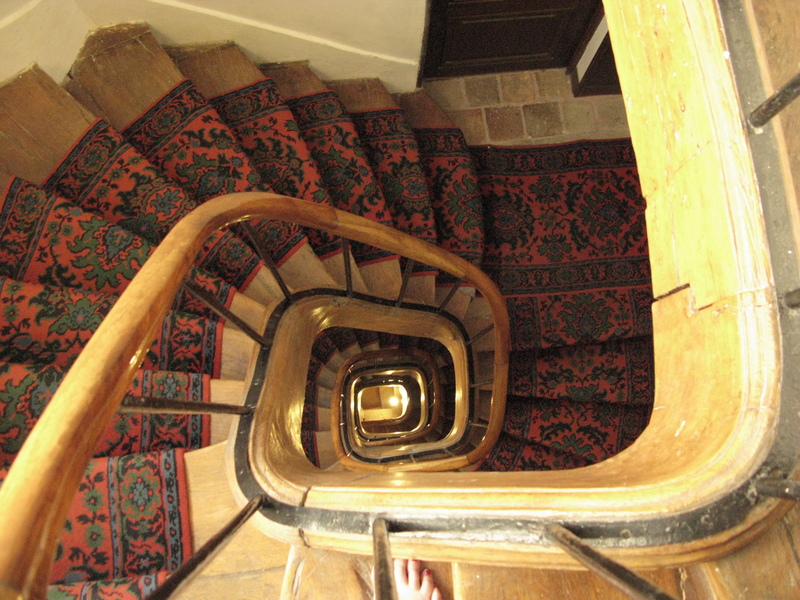 Often, “little inconveniences” is code for “dreadfully uncomfortable”, but not at the Hotel du Lys. It means they won’t demolish 17th century stone and beams to install an elevator or straighten a hallway. The ETs gladly sacrifice convenience for authenticity and affordability. The Hotel du Lys makes a perfect ET epicenter. The rue de Bucci market is a five minute walk, Melinda’s favourite Café de Flore is close by, Notre Dame, the Louvre and the Orsay are a stone’s throw away and the boulevards St.-Michel and St.-Germain are at the end of the road. Everything else is accessible from two nearby metro stops. A fine quartier indeed! The happy outcome was that we netted about 90€ per day in Found Money to finance wine breaks and gateaux chocolat. 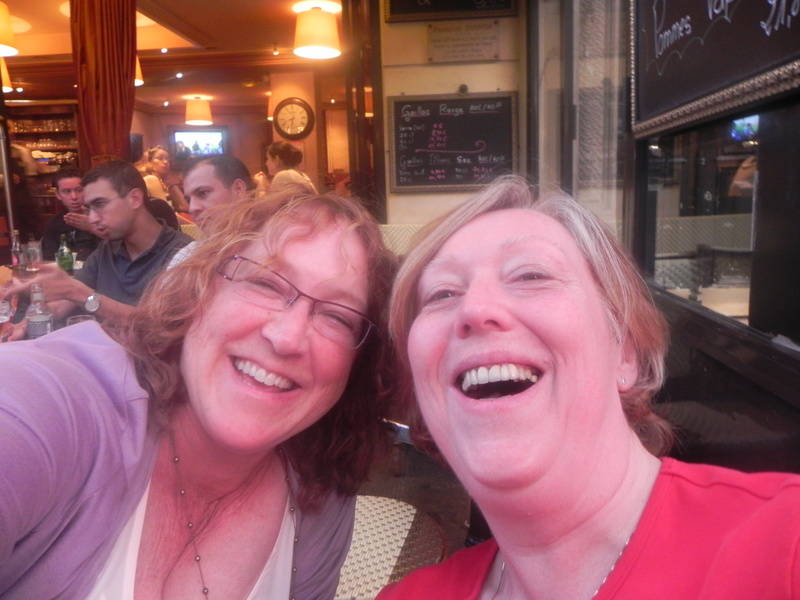 We spent most of that in the nearby Place St.-Andre des Arts, which makes an excellent base for evening drinks and gathering meaningful content for JuliesParis! 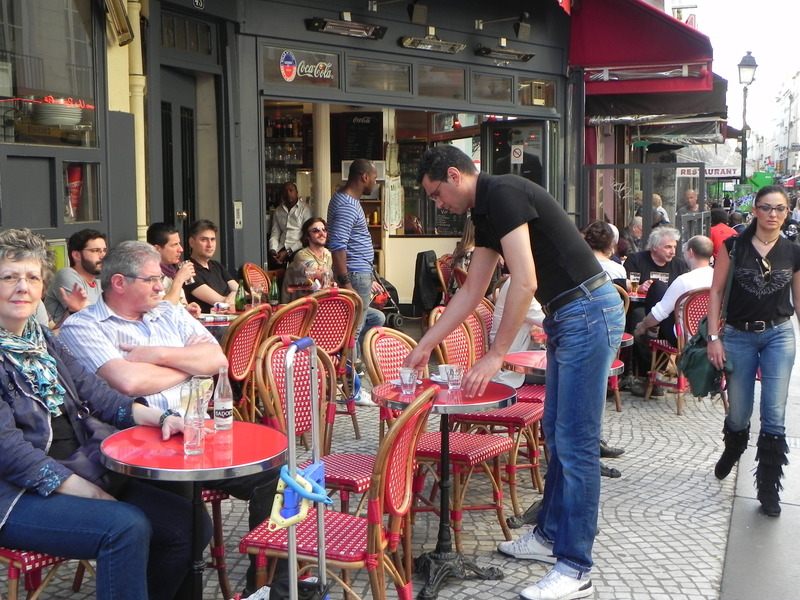 As we readied to leave for the airport, the owner shook my hand, looked intently at me and whispered “You love Paris. I think we’ll be seeing you again soon.”. I do, and she shall! My personal, private window in the Hotel du Lys, overlooking rue Serpente. Yes, I will be back.